Michael Dell, chairman & CEO of Dell Technologies, spoke in Boston this week. Republicans are pushing tax plans that only corporate America and the rich could love. Or so we thought. Eastern Bank CEO Bob Rivers said that every business would benefit from the lower corporate taxes being pitched by Republican leaders, but if the goal is to boost the economy, he’s not sure trickle-down economics is the answer. So let me get this straight. The GOP is pushing wildly unpopular proposals that threaten to gut the middle class — and some of the very people who stand to reap the rewards don’t see the logic of it all. Top White House economic adviser Gary Cohn will have you believe that big CEOs, as he has put it, are the “most excited group” about the tax plan. Republicans will also have you believe that companies are going to take the savings, expand, create jobs, and even raise wages. But what I keep hearing and reading about in earnings calls is that companies are instead likely to reward shareholders. Other executives bristle at the idea that tax cuts will drive hiring and boost paychecks. Sahin, who said she leans Democratic and has donated to the party, can think of better ways for Washington to help entrepreneurs like herself. Congress should invest in education because companies need more skilled workers, she said, and it should make child care and college affordable to all, while maintaining a health care system that people can afford to use. The tax bill, which voters disapprove of by a wide margin, is being debated this week on the Senate floor. It should be said that there are principles in the tax plans that captains of industry can support. The executives believe the US corporate tax rate is too high, compared with rates in other countries around the world. They believe the United States should move to a so-called territorial system in which businesses would pay US taxes only on profits they earn here in the United States. That’s different from the current system, in which companies are also liable for taxes on overseas profits. Both House and Senate versions propose such a territorial system, and it’s the chief reason General Electric Co., which does business in 180 countries, supports the Senate’s tax overhaul plan. As unhappy as Dell is with the current versions of the tax bills, he also wants the United States to change the way it treats foreign income from American companies. “The territorial issue is a big problem,” said Dell, whose federal political contributions skew Republican. The Austin, Texas-based executive was in town this week to speak at the Boston College Chief Executives Club luncheon and meet with the Globe’s editorial board. But wouldn’t lowering corporate rates be worth it? 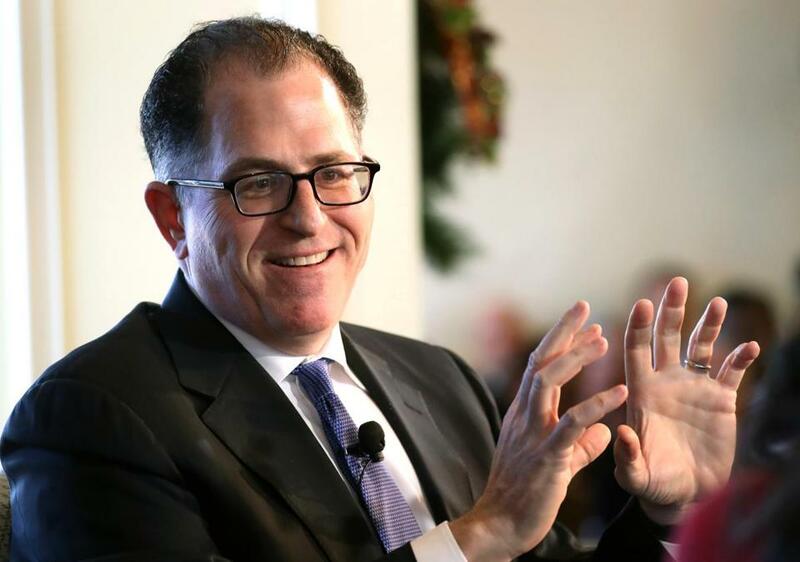 “If you have to do these things to lower the rates, then I think it’s a bad idea,” Dell said. Joe Tucci — the former EMC honcho who last year sold the Hopkinton data storage company to Dell — told me he’s not committed to any specific plan but believes the country needs to overhaul its tax system. “Having the highest corporate tax rates in the world for global companies cannot have a good ending. We’ve got to address it. You’ve got do it fairly,” said Tucci, who is now a private equity investor and doesn’t affiliate himself with either major political party. Of course, talking to all these former and current CEOs made me think they’ve got to be happy about their own personal tax returns, because the GOP proposals favor reducing taxes for the wealthy. Well, I’d be wrong again. That’s similar to what New England Patriots owner Bob Kraft apparently told his buddy President Trump over dinner earlier this year. Rivers, the Eastern Bank CEO, feels the same way after reading estimates of how much someone in his household income bracket would save. “I have had the conversation with my wife: ‘Geez, as much as we hate the plan, this is how much we personally benefit. So what do you think we should do with the money?’ ” Rivers said jokingly. But then he turned serious.